Life in the fog-bathed coastal dunes of the Namib Sand Sea is characterized by very rare behavioral, morphological and physiological adaptations that have evolved throughout its specialist communities. A large number of endemic plants and animals are globally-important examples of evolution and the resilience of life in extreme environments. There are some world heritage sites that you can visit in under an hour and see everything there is to see. There are others which take days to explore properly. The Namib Desert is one of the later. Prior to a conference I was attending in Namibia, I explored the desert for 5 days with a group in 4×4 vehicles. We went up, down, over and across dunes. We camped in the middle of nowhere with nothing but sand and stars. I even drove down a dune that was over 100m (300ft) tall that terminated at the coast of the Atlantic! 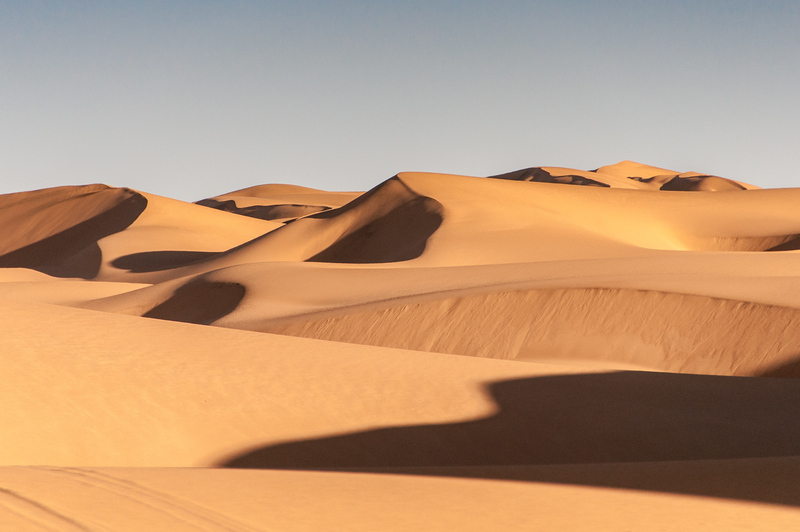 I’ve been to many deserts around the world, but nothing quite compares with the size and scale of the dunes in Namibia. If and when I get around to creating my own personal list of the wonders of the world, I think the dunes of the Namib desert will be on it. 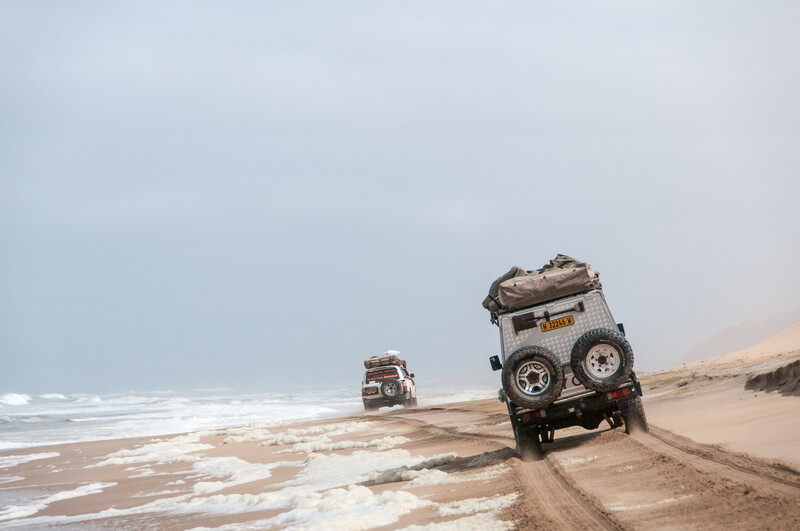 Visiting the Namib is best done from the cities of Walvis Bay or Swakopmund on the Atlantic coast. From either city, there are trips available which will take you into the dunes as well as sightseeing flights which will take you over the desert. I did both and I can highly recommend doing both as each gives you a different view of the desert. Namib Sand Sea is a natural UNESCO World Heritage Site in Namibia. It was inscribed in 2013 for its amazing natural desert landscape. This site is recognized for its natural beauty consisting of coastal fog desert. Meanwhile, there are two dune systems that are found in the Namib Sand Sea. There are also colored dune fields that make up this World Heritage Site. Most of the sand that makes up this desert are carried and have been deposited from far away land. 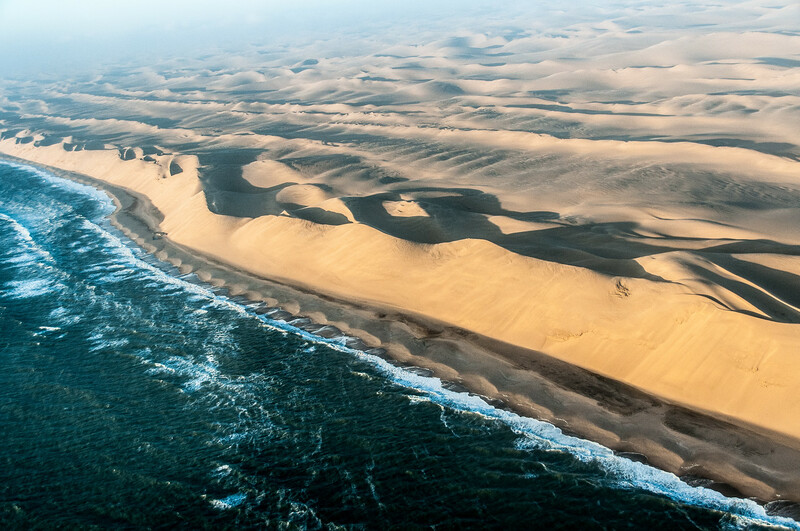 Perhaps the most unique feature about Namib Sand Sea is that it rolls right up to the ocean. The desert sand and waves of the ocean meet. Namib Sand Sea is the only coastal desert in the world. It is also the oldest desert in the world. The dune fields span about 3 million hectares in land area. There are two dune systems that form this particular desert landscape: one has been around since ancient times and the other is young and was recently formed. It is located on the South Atlantic coast of Namibia in Africa. This vast area made of spectacular sand dunes was not always like this way. In fact, the sand that forms the dunes now originated several kilometers away from its current location. Specifically, they came from the major rivers of southern Africa. 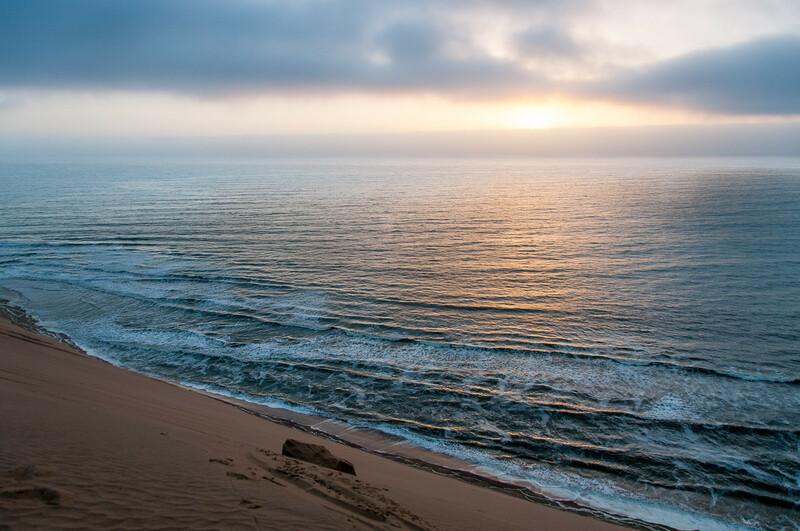 The river flows into the ocean and the natural process of erosion is responsible for transporting the sand into the dune fields that form the Namib Sand Sea. Once the sand is transported by strong ocean currents and made its way into the shore, the offshore ad onshore winds would blow them and create various formations. Namib Sand Sea is one of the largest world heritage sites in Africa. It is also located within the Namib-Naukluft Park. Hence, this site is highly remote with limited access. In fact, there are only a few roads that lead to this area. The Namib is an extremely dry desert. However, it supports a vast array of plants and animal species. These species have evolved with special adaptations that have allowed them to survive a hostile environment. Among the endemic wildlife that thrives in this environment include the Dune Lark, Welwitschia plant, and a few reptiles and invertebrates. We spent two days in Namibia last year and would love to go for a longer time. We have. A custom wall hanging woven by a local young man in Swakopmund that hangs in our living room. It of course shows sand and sea.